It's topped off with a green sesame seed bun. 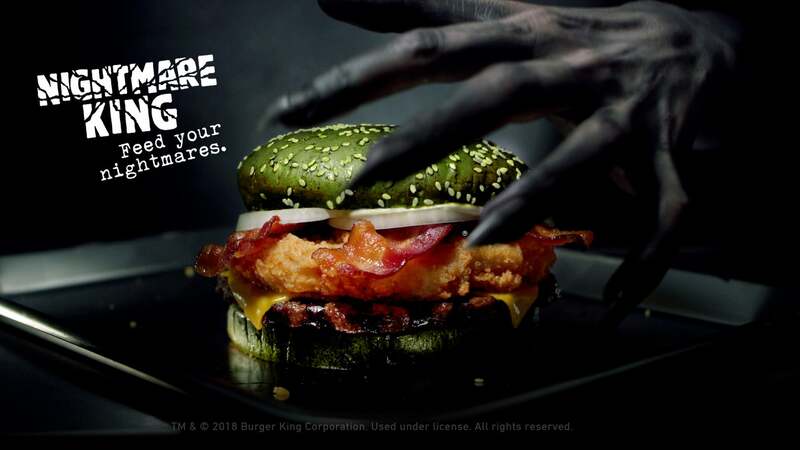 Burger King has rolled out a limited edition burger that's said to induce nightmares just in time for Halloween. The restaurant chain is releasing its "Nightmare King" next week. The burger includes a "mix of proteins like bacon, chicken and beef", as well as some oozy cheese. And as if a bun that looks like it's made entirely of masticated spinach molded together and dried isn't scary enough, BK also did a study on the effects the Nightmare Burger might have on those who consume it. "I remember hearing voices and people walking around talking", one test subject says. Another recalled "aliens attacking" the boat he was on. But just how scientific was that clinical study? But perhaps the real Burger King nightmare is its recent failing grade for using antibiotics in its beef products. Whether the increased bad dreams would be due to the spirits of the multiple animals whose parts you'd be ingesting, or simple due to indigestion, "science" seemingly supports the notion. Are you willing to see what dreams may come from this spooky concoction? Did they do a control group? "Caution: proceed at your own risk".